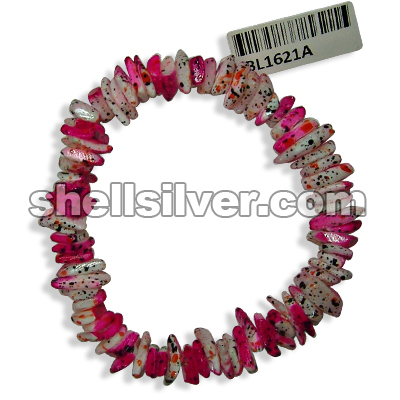 Bracelet 7.5 inches in white rose Thai dye fuchsia with orange and black. 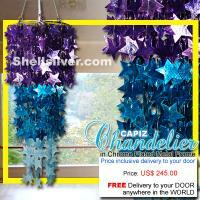 3 layers Capiz chips violet, blue and light blue star design, 56 strand, 495 pcs. 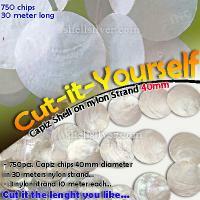 50mm capiz star chips, 23 inches base to bottom, head frame 8.5 inches diameter. 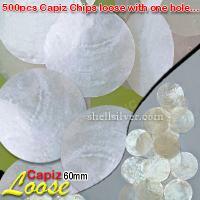 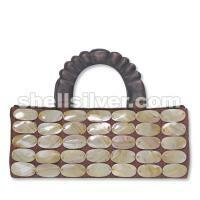 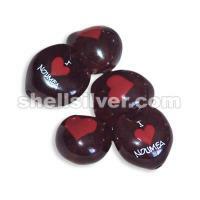 Capiz Shell Loose 60mm diameter - 500pcs Capiz Chips with one hole and delivered anywhere in the world. 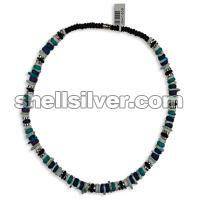 Necklace 18 inches in 7-8 mm white shell heishe, 8 mm silver coated flat pukalet, 8 mm coco pukalet black, light turquoise blue, dark turquoise blue and violet and white shell square cut with splashing blue and light blue.